Korean skin care is all the rage, but did you know that Korean food can work wonders on your body too? South Korea is one of the skinniest countries in the world, and for a good reason: their cuisine is as nutritious as it is delicious! Read on to find out more. This classic, Korean dish unites several slimming ingredients in one. Rice (or rice noodles), various veggies, beef, and egg. It's a wonderful mix of tastes and textures, and it's so easy to prepare. 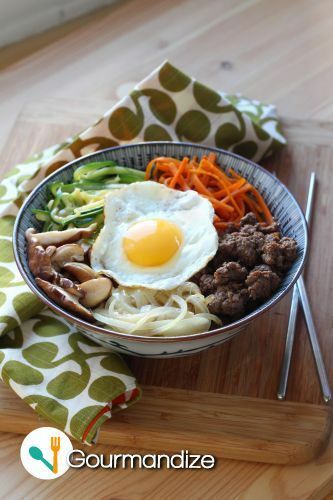 Check out our Bibimbap recipe here! Check out our delicious spin on the classic Brazilian cake, with Fererro Rochers and Kit-Kat! In a pan, melt together the condensed milk, the chocolates in pieces and the butter. Slowly fold in the thickened cream. Mix, without stopping, until it is smooth and thick. Transfer to the refrigerator and allow to cool for 1 hour. In a bowl, mix together the eggs and sugar. Add the oil and mix again. In another bowl mix together the flour, cocoa powder, baking powder and the bicarbonate soda. Pour in the egg mixture, mix together, then add the yogurt. Grease and sprinkle cocoa powder inside two springform pans. Divide the batter mixture between them, then bake at 360°F for approximately 20 minutes. Remove the cakes from the oven, and allow to cool. Spread some of the frosting between the layers of the cake, and generously spread around the outside. Decorate the cake with Kit Kats, extra frosting and Fererro Rochers, in your style! For more food buzz and delightful recipes, follow us on Facebook!